As anyone who works in the world of nuclear politics knows, the debate is profoundly repetitive. I was sitting in a meeting recently where one of my colleagues was reporting back to the group on the happenings of a conference on nuclear energy in Japan. When he was finished, a senior colleague related an almost identical experience that he had thirty years ago. Although the particulars of events change, the contours of the arguments remain the same. 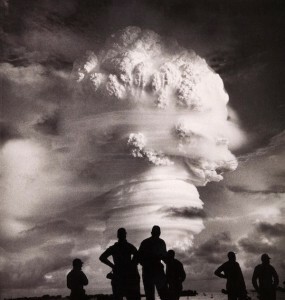 It’s rare to encounter an argument that does not conform to expectations and that’s what makes Frances Ferguson’s article The Nuclear Sublime (Frances Ferguson, Diacritics, Vol. 14, No. 2, Nuclear Criticism (Summer, 1984), pp.4-10.) so remarkable. The irony, of course, is that this “new” argument is thirty years old and now it’s my turn to repeat it (in fact the entire issue of Diacritics is “nuclear philosophy”). And, if that weren’t enough, her argument is itself the repetition of a story about the tension between the beauty of human life and the janus-faced character of the sublime first told by Mary Shelly in her 1818 publication of Frankenstein. What is so radical about Ferguson’s argument is that she enters the debate from a unique angle. She concerns herself solely with the argument for nuclear disarmament as one that lays its claim to legitimacy, not on an account of what maintaining a nuclear arsenal does to our lives today, but rather on the concern for the fate of those as of yet unborn. While the disarmament advocate Jonathan Schell identifies this future as one in which our progeny will be free from the feeling of claustrophobia generated by the constant threat of nuclear destruction, Ferguson points out the problem with a justification that prioritizes the claims of others, placing demands on and sacrifices from the self. The claims of the unborn to invade on our own claim to freedom: “To march off into a future free from nuclear peril is, from one direction, to free ourselves from claustrophobia, but it is, from another, merely to evade the claustrophobia inspired by the pressures of intersubjectivity…” The weight of the claims of the “unborn” is all the greater because the current non-existence of the future makes it pregnant with possibility, but whether or not the idea of this possibility inspires a sense of freedom or a different sense of claustrophobia is a matter of perspective. By applying the logic of the “sublime” from an earlier era to the nuclear sublime Ferguson reveals that the disarmament advocate’s justification for eliminating nuclear weapons fails to identify or cope with that which gives rise to the desire for the sublime: to escape the claustrophobia of the everyday by existing in the presence of something greater than the self. The sublime is “the thing that is bigger than any individual, and specifically bigger in terms of being more powerful and, usually, more threatening.” From this perspective, the logic of the nuclear sublime as collective immolation is the expression of freedom in its negative sense: “the outcome of the subject’s search for self-determination is not the achievement of absolute freedom in a positive form but rather the achievement of a freedom from the conditions of existence by means of one’s nonexistence.” We are free to destroy ourselves. If the crush of the demands of others becomes too much, we are free to escape those pressures through death. Ferguson’s writing style is so rich and pregnant with possibility itself, that it feels practically impossible to reduce her argument to a single conclusion. Each time I try, it seems like I have left the most important part out. However, what I take to be the lesson for the project of nuclear philosophy is that there is a tension between the sublime and the beautiful: “while the sublime courts the feeling of overextension as a version of individual freedom, the social world of the beautiful recoils at the way the notion of individual freedom seems stretched too thin to accommodates its various claimants.” She brings an awareness of the way that tension recurs in the nuclear debate and points us in a new direction. Rather than advocating disarmament in the name of the unborn or the fear of future destruction, Ferguson points us, instead, toward the notion that tackling nuclear disarmament is also about finding a way to live with the claustrophobia and beauty of daily life, which is different kind of imperative.